Frequent visitors to our blog are undoubtedly familiar with the work we did for Atlas Properties. Not too long ago, we manufactured 28 sign panels that would be installed in V-shape formations to alert motorists of available lease properties. Since the company wanted to protect its signage investment, we added anti-graffiti laminate that would make it easy to wipe off “artwork” left behind by taggers. Unfortunately one of their signs was vandalized with graffiti! Fast forward to today. 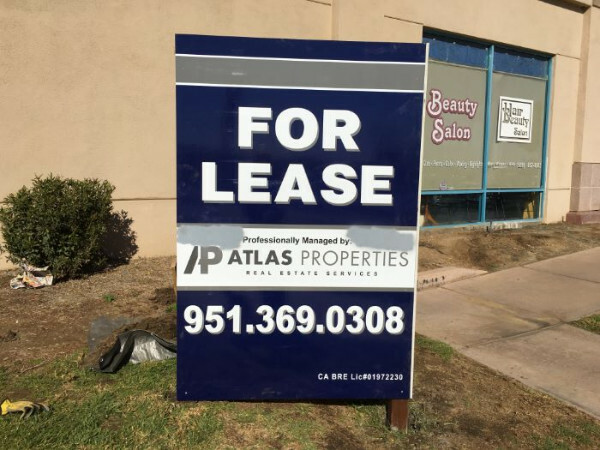 Atlas Properties contacted us again because the signage worked so well that the company sold one of the properties where we installed the products. As a result, the management team needed us to relocate one of our build-to-suit single-panel signs and one of the V-shaped markers that included two panels. The company wanted us to move these products to another side of the shopping center, which would allow the team to address motorists traveling on the adjacent streets. 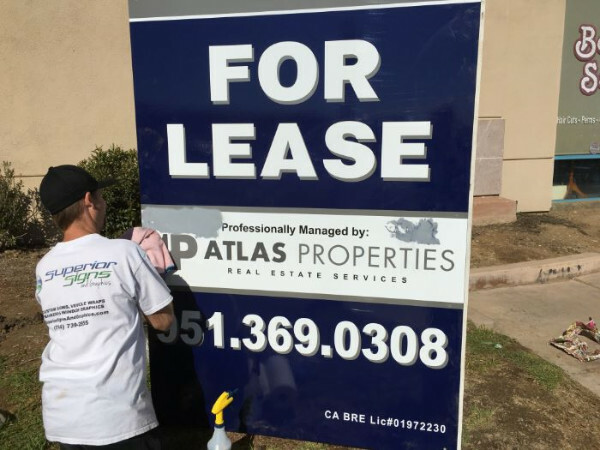 Now, the anti-graffiti signs for property managers in Orange County, CA, continue to work hard for the company. Because they chose an anti-graffiti sign, the vandalism was easily removed! However, in the process of dismantling and moving the signage, our technicians realized that there had indeed been some graffiti activity. A tagger had used a permanent marker to vandalize the product. Unfortunately, a tenant or maintenance worker painted over the graffiti with gray paint to match the look of the surface. This individual may have been unaware how the anti-graffiti laminate works. Rather than reaching for the paintbrush, it would have been possible just to wipe off the unsightly marker without damaging the laminate. The manufacturer has put together an excellent video that shows just how quick and easy it is to get rid of nasty spray paint and permanent marker. That said, our technicians succeeded in removing the paint as well as the graffiti with rubbing alcohol and a good bit of hard work. If the person trying to get rid of the markings had simply decided to wipe them off, no alcohol or elbow grease would have been required. Who Benefits from the Display of Signage with Anti-graffiti Laminate? Now the sign is as good as new! We have worked with a broad range of professionals who now use an anti-graffiti laminate to protect their investment in signage. Real estate professionals. When you list homes, these properties need to look their best. When permanent marker makes signage unreadable or simply mars the professional appearance of the product, some potential buyers might keep on driving. With the application of the anti-graffiti laminate, simply wipe off the sign to restore its professional look. Property management companies. Prospective tenants may shy away from leasing a property that is advertised with defaced signage. Moreover, since these businesses work with large quantities of sign products, it makes sense to protect the investment rather than repeatedly pay for replacements. Property owners. If you rent apartments, it occasionally happens that property signage is scribbled on. Restore the original look of the products simply by wiping them clean. There is no need to repaint or replace these signs. 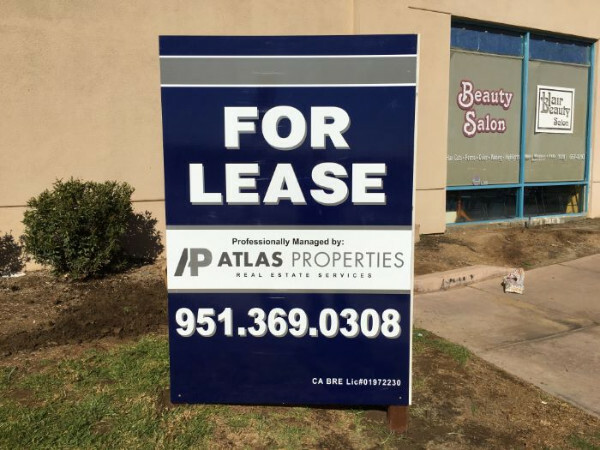 Contact us today to learn more about graffiti-proof signs for property managers in Orange County, CA, as well as the benefits that this product also offers to retailers and service providers.